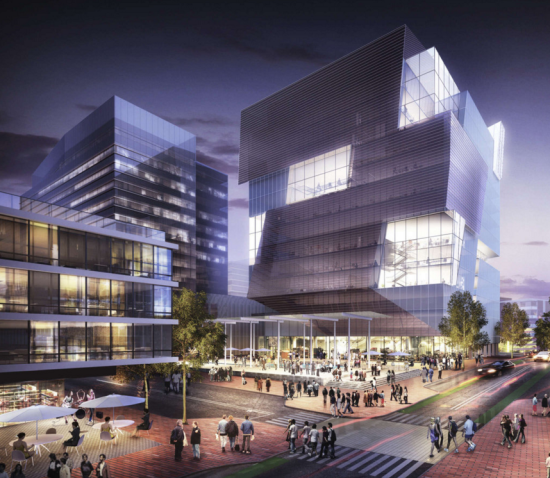 The Raymond G. Perelman Center for Jewish Life at Drexel University, designed by San Francisco–based Natoma Architects, anchors Jewish life on Drexel's campus. 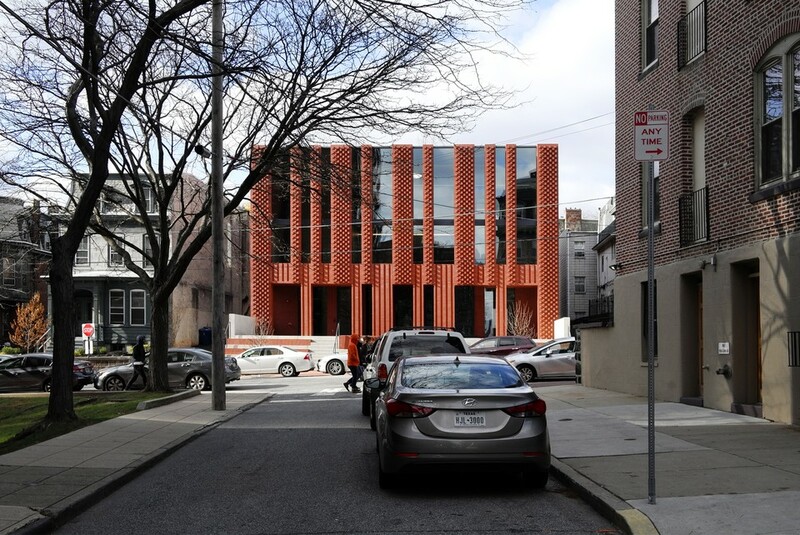 Its complex brickwork references the weaving of tallit, Jewish prayer shawls, and Philadelphia’s vernacular redbrick facades. 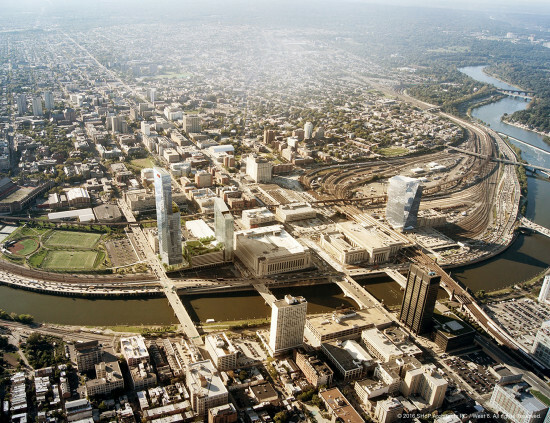 The 32nd Street corridor at Drexel University in Philadelphia has become a hub for student gatherings, interaction, and events. Situated between Chestnut and Market Streets in the campus center, the corridor’s current design, however, does not serve the social and functional needs of its college population. 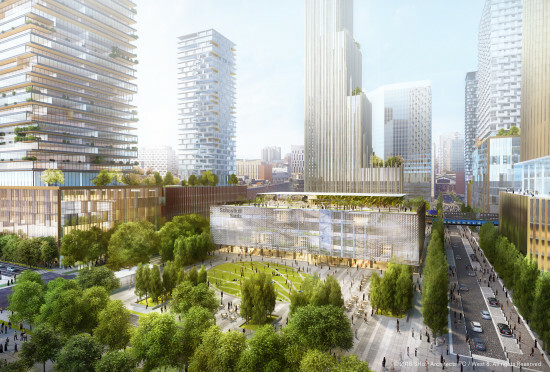 In March, landscape architecture firm Andropogon released primary renderings and plans for a complete redesign of the space now known as Perelman Plaza. In August, more comprehensive images were revealed, and now the project is underway. Two weeks ago, Andropogon broke ground in Phase One on the site, razing the existing awkwardly angled hardscape to begin construction of a practical design for the coexistence of human traffic and nature. 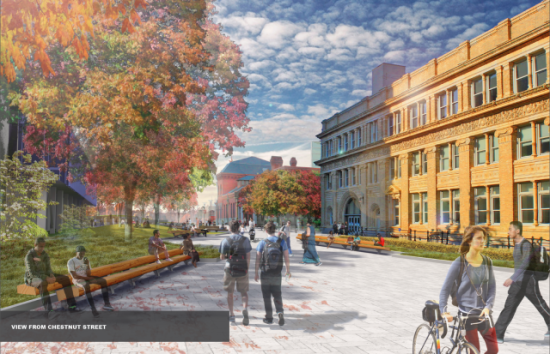 Perelman Plaza, named after its $5 million benefactor Raymond G. Perelman of the Raymond and Ruth Perelman Education Foundation, is set to foster community within the student body as a physical connection of the campus buildings surrounding the site. 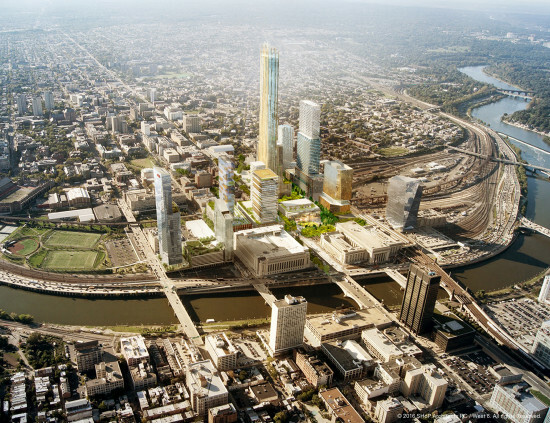 Plans reveal that Perelman Plaza will serve as an important link between old and new Drexel University structures, including the LeBow College of Business and the mixed-use Chestnut Square, both set to open in Fall 2013. Phase One of the plaza's creation will focus mostly on the landscape architecture of Cohen Garden, nestled in the courtyard between the Bossone Research Enterprise Center and the adjacent Peck Alumni Center. Future phases of the Perelman Plaza design will coordinate student spaces for large outdoor events, seating, and pedestrian traffic with natural settings for shade and aesthetic appeal. 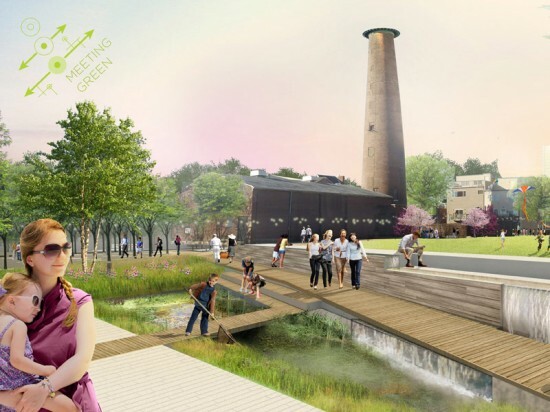 Andropogon has also proposed sections of high performance landscape that will be modified for sustainable management of rain and stormwater. 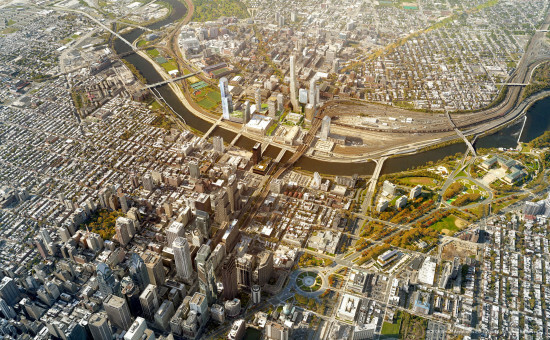 The project is part of Drexel’s larger Campus Master Plan, an initiative extending through 2017 for expansion and improvements within the university that will better integrate it with the city of Philadelphia. 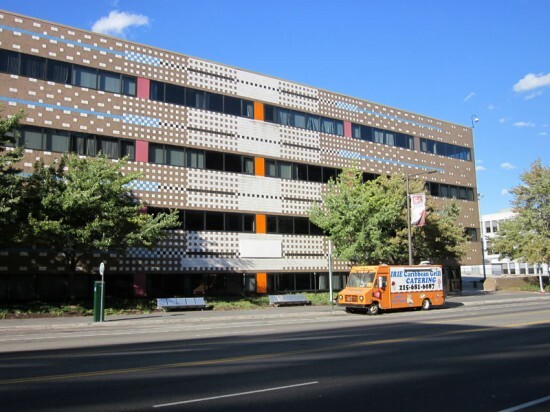 A few years ago Drexel University embarked on an ambitious plan to convert one of Philadelphia’s iconic postmodern landmarks by Venturi Scott Brown Associates (VSBA) into a new home for the Antoinette Westphal College of Media Arts & Design. Tonight the University will celebrate the official opening of its new building, dubbed the URBN Center, with a series of performances and demonstrations to showcase student work. Minneapolis-based Meyer, Scherer & Rockcastle (MS&R) led the renovation of VSBA’s 3501 Market Street, formally the Institute of Scientific Information, and the adjacent building at 3401 Filbert Street (designed by Bower, Lewis & Thrower). Pritzker-winner Robert Venturi and his wife and partner, Denise Scott Brown, famously called their buildings “decorated sheds,” a phrase intended to reflect a design philosophy that spaces should adapt to a variety of uses—hence, making Drexel's decision to overhaul the interior of 3501 Market in keeping with the architecture duo’s original intent for the building. MS&R re-imagined the vast blank floor plan, but the firm was careful not to meddle with Venturi’s colorful mosaic facade. The firm radically changed the 140,000-square-foot facility—creating a dynamic maze of stairways and beams that spill into a number of different work spaces that house a music recording studio, a video game design lab, a printing studio, and a television broadcast production facility. Richard A. Hayne, a member of the board of trustees and the CEO of the Philadelphia-based brand Urban Outfitters, donated $25 million to Drexel to buy the building. The university raised the remaining $47 million to fund construction costs. Three Winning Teams Imagine Sustainable Infrastructure for Infill Philadelphia: Soak It Up!